Iron Creek Farms is one of my usual stops at the Green City Market. They always have the most beautiful heads of lettuce and other greens, peppers, squash, tomatoes, onions, and much, much more. This past weekend I found these beautiful European seedless cucumbers. 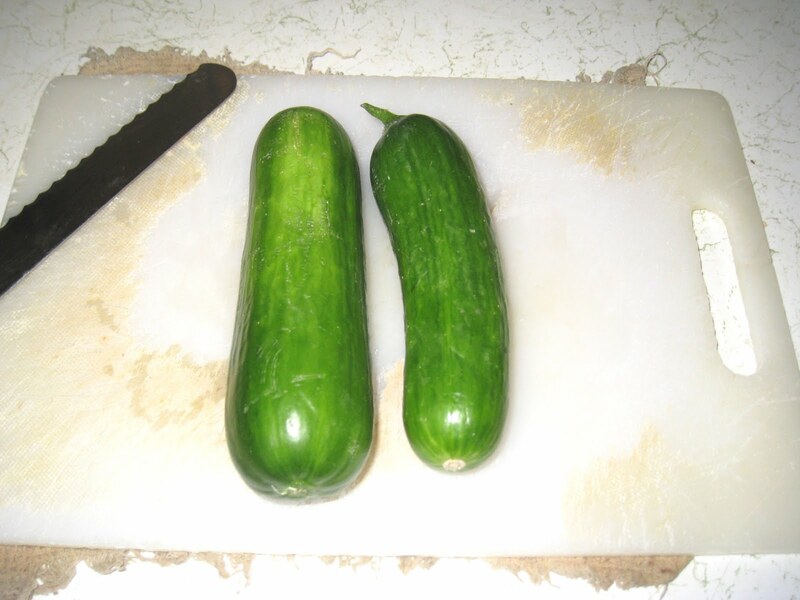 They were small and firm and my immediate thought was what a beautiful cucumber salad they would make. I had just purchased a bundle of three red torpedo onions and fresh dill at two other stands for another purpose and I would have extra of each, so it was a no-brainer to grab the cucumbers and take them home with me. They were firm and delicious. 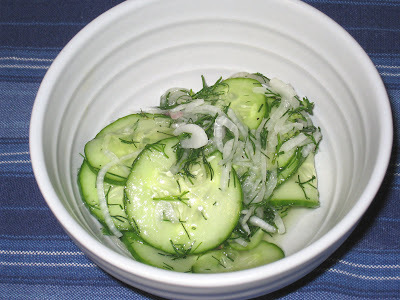 Most cucumber salad recipes direct you to cover the sliced cucumbers with salt and let them drain for a half hour to get rid of the excess liquid, and then rinse them before you use them. With these babies, that was not necessary. I simply sliced them as thinly as I could without a mandoline (on my wish list, though) and combined with the onions and dill and let them marinate in a vinegar/sugar mixture. A couple of hours later I was rewarded with a side dish that was light and refreshing. Combine the cucumber and onion in a small bowl. Add the vinegars, sugar, salt and dill and mix well. Make sure the bowl is small enough for the vinegar to cover most of the cucumber and onion mixture. Cover and refrigerate for a few hours before serving, stirring the salad to re-distribute the cucumbers and onion in the marinade. Season with salt to taste just before serving and adjust the amount of sugar if necessary. This salad will keep for about a week in the refrigerator.